Attending Colonial Inauguration as a freshman is like taking a trip to Disney World. Students drive or fly in with their parents and perhaps siblings in tow, then spend three days participating in GW’s specialized programming. The weekend is complete with performances, sightseeing trips and enthusiastic Colonial Cabinet members dressed in uniforms paired with brightly colored accessories. For all intents and purposes, CI is like a vacation. 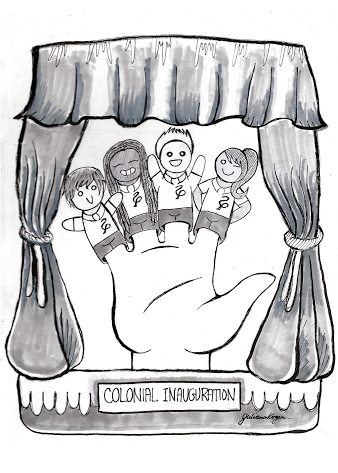 And preparation for next summer’s freshman vacation has already begun, as GW will host information sessions this month for current students interested in becoming Colonial Cabinet members. Because it takes place during the summer and is so far removed from freshman move-in, the structure of CI isn’t as effective as it could be. Right now, GW is doing its students a disservice by keeping their orientation so separate from the rest of their freshman year. Instead, the University should hold CI during the week before classes start, and save incoming freshmen from the headache of disrupting their summers. Nine of GW’s peer schools, including Georgetown University and New York University, hold freshman orientation right before classes begin. It’s unfair for GW to force incoming freshmen to travel to D.C. twice in the same summer. Depending on the distance students and their families have to travel, they might be paying thousands of dollars to fly to D.C. and stay in a hotel for both CI and move-in. Considering the fact that tuition for incoming students has consistently increased every year for the past few years, it makes sense for GW to help students save money by eliminating that extra trip. Plus, attending CI two months before class starts is simply inefficient. Students need to learn so much during their three orientation days – about everything from study abroad options to GW’s drug and alcohol policies – that it’s impossible for them to retain everything between CI and the start of classes. After they head back home to spend several long weeks with their friends and families, it’s unlikely they’ll remember exactly where Mental Health Services is, or how to look for internships on GWork. Officials have already taken steps over the last several years to make CI more informative, adding more information about sexual assault awareness and retiring the over-the-top laser light shows. Holding CI closer to the start of school could further that mission. As overwhelming as CI is, it isn’t quite as hectic as Welcome Week. Right now, Welcome Week serves as a pseudo-orientation, during which students are bombarded with emails about information sessions for their majors, student organizations and University processes. Meanwhile, they’re still expected to attend classes – along with figuring out which ones to add, drop or keep. It’s all too much for students to handle before they’ve had a chance to adjust to campus, which likely leads many of them to miss out on these events altogether. Holding CI the week before classes in lieu of Welcome Week for freshmen would make students’ first few days on campus much less stressful for everyone, since it would eliminate the need for information sessions and events during the first week of class. And it would give the University the chance to involve more student organizations in orientation, too. With more students on campus, student organizations could co-sponsor events and host their own, giving freshmen a more well-rounded picture of student life than they would ever get by stopping by the student organization fair at CI. This could also take some pressure off of Colonial Cabinet members, since they would no longer be the only current students on campus representing GW. Of course, one of the most important benefits of CI is that it allows students to meet their future classmates. But summer orientation is broken up into four sessions, meaning students only interact with a small portion of their class. And since international students are all required to participate in the last CI session, they’re cut off from all of the other freshmen. Holding orientation over the summer inhibits class bonding. If freshmen all participated in CI together, they would meet a more diverse mix of domestic and international students, and may have a better sense of what their graduating class is really like. Freshman orientation should be about helping students acclimate to college life, but that can only work if orientation feels realistic – and right now, it doesn’t. Instead, parents are just a few blocks away, there are few current students on campus and the entire process feels rushed and temporary. Moving orientation to the week before class would not only paint a more accurate picture of GW, but would also give students plenty of time to steady themselves before their classes begin. CI isn’t really helping students to adjust – it’s simply giving them a quick view of a carefully controlled and glamorized version of campus. The editorial board is composed of Hatchet staff members and operates separately from the newsroom. This week’s piece was written by opinions editor Sarah Blugis and contributing opinions editor Melissa Holzberg, based on discussions with sports editor Nora Princiotti, design editor Samantha LaFrance, copy editor Brandon Lee and assistant sports editor Mark Eisenhauer. This article appeared in the November 9, 2015 issue of the Hatchet.